Shavrov Sh-2 was a 1930s amphibian design and the first Soviet mass produced flying boat. The small, wooden aircraft was a further development of the Sh-1, with a more powerful engine and increased size. The Sh-2 could carry two crew members as well as one passenger and during wintertime, the aircraft could be equipped with skis. The small lower wing served as attachment for the stabilizing floats. It was a light, simple and reliable design. 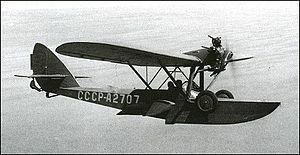 The Shavrov Sh-2 was developed from the small amphibian Sh-1 prototype design and performed its first flight on November 11, 1930. The Sh-2 passed State Acceptance trials on June 12-17, 1934, without problems. Series productions was initiated on 1 April 1934, and ended two years later. However, due to its successful design and the popularity among its pilots, production was restarted in 1939. Total production was up to 700 aircraft, several hundred of those being built after 1939. The aircraft was in service until 1964 and set a number of records among flying boats and seaplanes. On 28 August 1942, the Finns captured two such aircraft and passed them into their own service. There they were used in the liaison role, as well as carrying the Commander of the Finnish Air Force, until 1944. Picture - Shavrov Sh-2, at the Historic Aircraft Restoration Museum. De Michelis, Bruno. "The Russian Aero-marine from 1910 to 2001".